What's Next for More Than Carrots? Some of you have been following us for a while, some have just met us. This post is a summary of our last couple of months. Our product is explained in more detail here. More Than Carrots has been going for about 2.5 years. Our brand is well-liked and the topic ‘meat reduction’ is more relevant than ever. On the flip-side, we want to focus on creating solutions for meat reducers. We launched 6 different products. None of them really caught on. As part of our last solution, we have built a database of hundreds of ‘mainstream’ London restaurants, which we ranked by how easy they make it for meat reducers to skip the meat. But we haven’t really found a good way of making all this information accessible to you. As of last month, we have run out of funding. The logical thing to do would be to stop. We discussed that option a lot. ‘The Market’, as in all those much talked-about ‘Meat Reducers’, may not be ready for selecting restaurants in a different way yet, but it will be at some point. And we want to be there when it is. Our planet is just too important for us to stop working on this. We won’t go into more detail here. If you found us, you probably agree. Our App is different in that we don’t shy away from saying which restaurants we believe are NOT great at veggie. 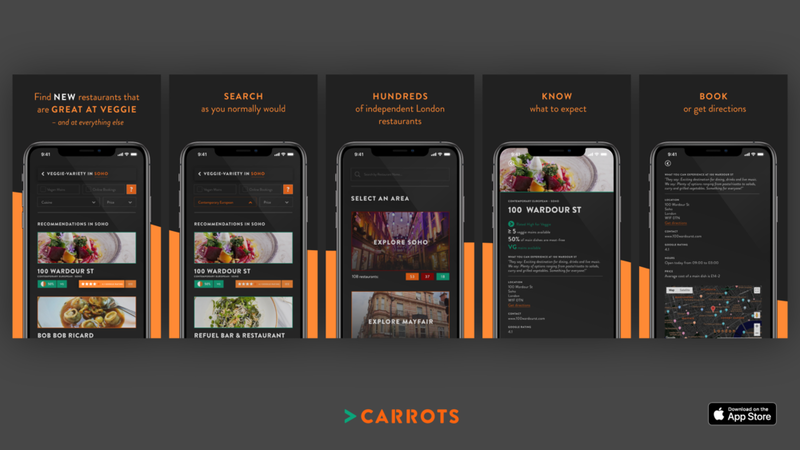 Our App is also different in that it allows you to search by using the criteria you normally search for (location, cuisine, price) instead of focusing on dietary needs. We THEN show you which relevant restaurants have the best veggie and plant-based offerings. And, our App is different in that we don’t just focus on what dishes exist, but also on how easy it is to order them. We assume that 90% of the population would still prefer enduring a root canal treatment over publicly asking for a vegan menu. So restaurants that ‘hide’ their plant-based food don’t score highly. In addition, our newsletter will keep delivering restaurant ideas straight to your inbox once a week. You can subscribe here. If you’re in Central London, maybe even join one of our new ‘Less Meat-Ups’. We host them in our favourite restaurants to discuss all of this in person. Here is the ‘secret’: Restaurants want to please their customers. They are ready but they will only take a plants-first approach if we (the market) tell them that that’s what we want! Let’s show them that we do.